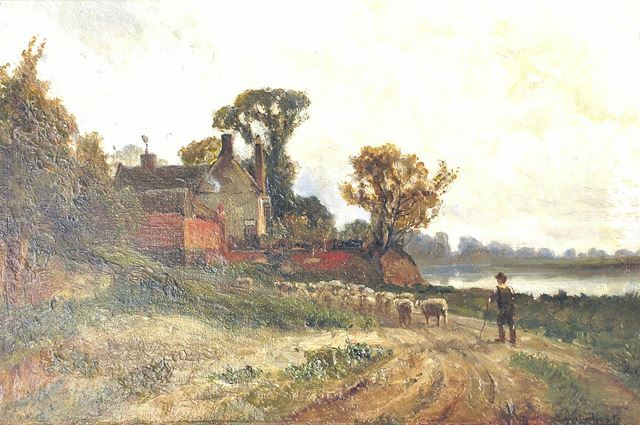 This painting was exhibited by Redgate, a prolific local artist in 1902 and sold for £7 10s (£600 in 2011 values). This cottage was better known as 'Kirk White's Cottage' as it was used by the poet Henry Kirk White. The following account of Henry Kirke White and his cottage is extracted from the excellent 'Wilford' internet web site: 'Henry Kirke White was a Nottingham poet who drew inspiration for much of his poetry from Wilford and Clifton, the most notable being his poem 'Clifton Grove'. He was born in 1785 in Nottingham where the Exchange Walk Arcade now stands on Cheapside. A small slate plaque just inside the entrance to the Arcade marks the location. He was the son of a butcher who became a lawyers Clerk in Bridlesmiths Gate when 14 years old. He put all his energy into his work and his studies before taking his first steps into poetry. 'In fact he was expending so much energy in work, studies and poetry that he was becoming ill.' He became so fragile he believed he was about to die and made it known he wanted to be buried in one of his favourite locations, Wilford. In preparation for University in 1804, Henry Kirke White was advised to spend a month on the coast to gather his strength. He instead chose his favourite Nottingham location of Wilford. He would spend time in the church yard under his favourite tree or in a small wood hut on an islet in the Trent facing Clifton Grove. The exact location of his residence in Wilford has been mis-represented over the years as the Manor House near Wilford Church. He described the location to his brother as 'a little cottage at Wilford where I have taken a room ... I live in a homely house in a homely style ... and (am) perfectly at my ease'. Hardly the description a butchers son would give to the small stately manor house. From an account of Wilford published in 1835 by a Matthew Barker, the actual location of the cottage can be deduced as opposite the Wilford library on Wilford Lane (Seen here). The original cottage was demolished in 1899 and the village Post Office now stands in its place. Barker describes the location as follows :- 'four cross roads, that on the left leading to the Nottingham turnpike road, the one in front goes to Ruddington, and ... the right to the banks of the Trent and Clifton. The corner house on the right is of ancient date, and was formally an ale house. The house adjoining ... is the place where Kirke White resided, when preparing himself for collage.' This description fits the Post Office location perfectly. After his stay at Wilford, Kirke White left for Cambridge to begin his studies. By 1806 his health had failed him and to such an extent that 'his mind was worn out, and it was the opinion of his medical attendants, that if he recovered, his intellect would have been affected.' White did not recover and was buried at the All Saints Church in Cambridge at the age of 21. His early death sparked a tide of sympathy for such a hard working youngster who had shown himself to be full of potential. It is for these qualities he is really best remembered. His poems were reappraised and looked on more charitably and he became a poet of mild note for his time. A memorial stands to him in St Wilfrid's Church, Wilford.